In the DigiFreq Contest area you can sign up to have the chance to win free music recording products each month. These are brand-name products from major manufacturers like Cakewalk, Sony, Native Instruments and more! Just follow the instructions below to join in on the fun and have the chance to win! 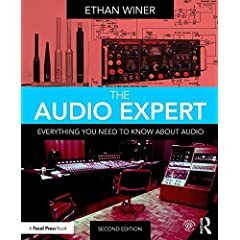 The Audio Expert, 2nd Edition from Focal Press and Routledge. If you don't want to wait for the contest to end, you can purchase a copy of the book right now for 20% off using the following coupon code: FLR40. Click the following link to place your order: The Audio Expert, 2nd Edition. Sign-up for the FREE DigiFreq music technology newsletter, and you're automatically entered in the contest. To sign-up, fill in the following form and click Yes!